2018 A linguist by training with a keen interest in the visual arts, his career in cultural relations involved postings in South-East Asia, Hong Kong, North Africa, China and Italy. On return to London he took up printmaking, drawing inspiration from the rich historical and aesthetic stimuli of his overseas experiences. He works in a variety of media including intaglio, aquatint, drypoint, mezzotint, monoprint, collagraph and screenprinting. 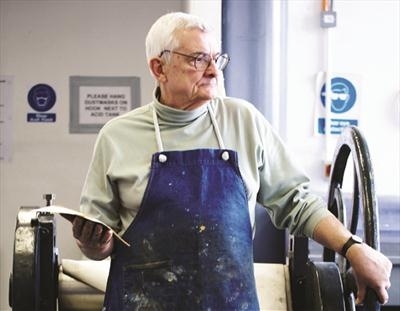 He is a founder member of Nineprintmakers, a group of London artists who share the same studio facilities.